Epoxy « Global Market Insights, Inc.
With building developers becoming more conscious about the strength, ductility, and toughness of construction material, polymer concrete market has observed a renewed traction lately. This material is widely preferred on account of its benefits such as improving adhesive characteristics of old surfaces, tensile strength, freeze durability, and flexural strength. In addition, heavy investments in the global construction sector are being made lately, increasing the demand for various types of polymer concretes for providing impermeable toppings over the bridge decks, additives for plasters, and filling for installing tile. The growing involvement of public and private firms in infrastructure development across residential, commercial, and industrial sectors will thus have a significant impact on the polymer concrete industry share. In line with the growing construction activities and rising focus on the surging use of polymer concrete materials, the giants in the polymer concrete market are looking forward to investing in capacity expansions. The countries across the Middle East for instance, have been rapidly expanding their existing facilities. In addition, regional governments have been making substantial investments on infrastructure development across this region, further generating lucrative opportunities for the market players. Validating the aforementioned fact, one of the leading contributors of polymer concrete industry, Sika has expanded its regional reach across United Arab Emirates recently with the establishment of a new concrete admixture production plant in Dubai. The development of a local polymer production facility is slated to reduce the production cost that will become beneficial for customers across the GCC (Gulf Cooperation Council) to fulfil their concrete admixture requirements considerably. In addition, owing to the depletion of fossil fuel resources, the UAE government is shifting its focus on tourism rather investing in oil and gas exploration to diversify the economy. 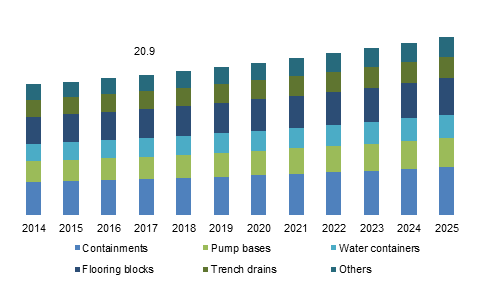 The increasing development of logistic centers and surging deployment of green technologies will propel Middle East polymer concrete market share over the years ahead. The rising concerns about the carbon dioxide emission is one of the causes fueling the polymer concrete industry outlook. The surging use of cement in road construction activities has led to an increase in carbon dioxide emissions across the globe. On this note, efforts are being made to utilize polymer concrete on a large scale. Reportedly, in Australia across the Victoria region, pavements, roads, and freeways have been developed with the help of geopolymer concrete. Geopolymer is a long molecule that can improve the strength of concrete effectively. The research community, on these grounds, has also been attempting to invest in research and development activities for the betterment of geopolymer concrete. The involvement of regional governments in the development of smart roads for controlling the emissions will thus generate significant business opportunities for the giants in polymer concrete market. In several earthquake prone regions, to build foolproof earthquake resistant buildings, engineers have been focusing on the use of effective alternate materials. On this note, it is imperative to mention that the researchers from the University of British Columbia have invented new concrete that would be able to withstand tremors. This newly invented eco-friendly ductile cement comprises polymer based fibers that could increase the malleability of concrete instead of letting it crumble under pressure. The increasing importance for lightweight, intelligent, energy producing, and innovative concrete structures across the globe will thus have a positive influence on polymer concrete industry size over the years ahead. The robust shift in the focus of building developers toward constructing eco-friendly infrastructure over the last few years will push the use of polymer concrete on a large scale. The stand taken by regional governments to improve the economy with considerable investments in roads, buildings, bridges, and renovation of old monuments is also poised to fuel polymer concrete industry trends significantly. For the record, by the end of 2025, polymer concrete market will surpass a revenue collection of USD 600 million. This entry was posted in HVAC and Construction and tagged Acrylate, APAC Polymer Concrete Market, Canada Polymer Concrete Market, Epoxy, Europe Polymer Concrete Market, Furan, Latex, PC, PIC, PMC, Polyester, Polymer Concrete Global Market, Polymer Concrete Industry, Polymer Concrete Industry Analysis, Polymer Concrete Market, Polymer Concrete Market 2018, Polymer Concrete Market 2024, Polymer Concrete Market analysis, Polymer Concrete Market forecast, Polymer Concrete Market growth, Polymer Concrete Market report, Polymer Concrete Market share, Polymer Concrete Market size, Polymer Concrete Market trends, U.S. Polymer Concrete Market, Vinyl. The robust growth of the global automotive sector is certain to emerge as one of the driving forces of industrial liquid coatings market in the years to come. Industrial liquid coatings, equipped with resistance to corrosion, acids, UV rays, oils and other type of impurities that can deteriorate metals and hinder the performance of equipment, are deployed in automobiles, transportation equipment, electronics appliances, wood and non-wood furniture, metal building products, and metal containers. Indeed, OEMs have emerged one of the most remunerative application arenas for these coatings. Polyester is one of the most widely used resins for industrial coatings. Polyester encompasses a superior chemical bond and is ideally temperature resistance to most materials. That said, the resin is also endowed with some other properties – polyester is known to abrasion resistant and provides prolonged corrosion protection. Both the aforementioned characteristics make polyester-based coatings ideal to be used in the marine sector and various other industrial applications, thereby augmenting the commercial landscape of polyester-based industrial liquid coatings market. 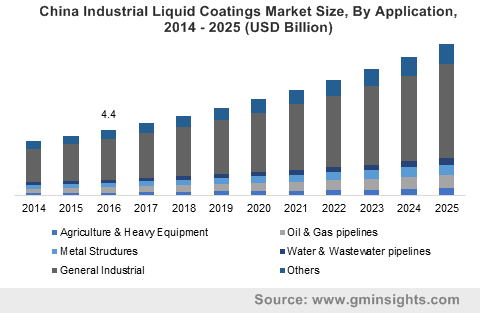 Polyester-based industrial liquid coatings industry size was valued at $8 billion in 2017 and is projected to grow at an appreciable pace over 2018-2025. Apart from its excellent properties, a pivotal reason for this industry to depict growth is that polyester coatings have the benefit of being cost efficient compared to other available coatings. Epoxy is another type of resin that is very widely used in coating production. The principal factors responsible for the deployment of epoxy are its excellent properties – the material is tough, enables quick drying, has a protective nature, and is endowed with other mechanical properties as well. Driven by its highly favorable characteristics and its subsequent benefits in coatings, epoxy manufacturing is generally undertaken on a large scale. As per the AMEC Environment and Infrastructure UK (AMEC) reports, a total of 259,000 tons of epoxy resin was manufactured in 2013, in plants located in Germany, Spain, Netherlands, Poland, and Switzerland. In 2017, epoxy resin accounted for a commendable 30% of the industrial liquid coatings market share and is anticipated to depict a positive growth graph in the ensuing years. Reportedly, epoxy-based industrial liquid coatings are applied on the inside of cans as a protective coating that prevents corrosion and prolongs the shelf-life of the can and stored food. Additionally, it also serves well in terms of lending an aesthetic look to the can. Similar coatings are also used in the construction of wind turbine blades and metal structures. Owing to the fact that epoxy based coatings are relatively easier to apply as opposed to conventional heat cured powder coatings, they are used across a plethora of applications, thereby impelling epoxy-based industrial liquid coatings market share. Speaking of epoxy, it is prudent to mention that the resin is widely popular in Europe. According to the AMEC Environment and Infrastructure UK (AMEC), Germany is one of the largest markets for epoxy resins in Europe, and had accounted for sales of sold approximately 88,000 tons of epoxy resin in 2013. This represents an appreciable 35% of all European sales. The UK accounted for the second largest volume of some 11% the same year, while Italy and France both witnessed for around 10% of total epoxy sales. It is thus rather overt that Europe industrial liquid coatings market, that held around $10 billion in 2017, will register a commendable growth rate owing to the surging epoxy production in the region. One of the vital factors that may possibly restrain the growth of industrial liquid coatings market is the adverse impact on human health caused due to the release of fumes from volatile organic compounds (VOC). As per the United States Environmental Protection Agency’s Total Exposure Assessment Methodology (TEAM) study, people exposed to VOCs experience conjunctival irritation, throat and nose discomfort, allergic skin reaction, headache, nausea, fatigue and dizziness. However, regulatory bodies, in this regard, have enforced certain norms that mandate companies to use less VOC-emitting products. In accordance, bio-based industrial coatings have emerged as the latest trends, adding a new growth dimension to the overall industrial liquid coatings market. This entry was posted in Bulk & Specialty Chemicals and tagged Acrylic, Agriculture & Heavy Equipment, E-Coats, Epoxy, General Industry, Global Industrial Liquid Coatings Market, Industrial Liquid Coatings Industry, Industrial Liquid Coatings Market, Industrial Liquid Coatings Market Overview, Industrial Liquid Coatings Market Segments, Industrial Liquid Coatings Market Size, Liquid Primers, Liquid Top Coats, Metal Conditioners, Metal Structures, Oil & Gas Pipelines, Polyester, Polyurethane, Resin, Water & Waste Water Pipelines. In the last few years, advanced polymer composites market has witnessed a remarkable growth graph with the increasing requirement for composite materials across the aerospace, automotive, and construction sectors. With the favorable advancements in the material science technology, researchers have successfully come up with a new range of products that have become alternatives for already existing metallic materials. These composite materials have nearly similar properties to that of metallic materials, but have far less weight density as compared to metal composites. In this regard, the aircraft and automotive manufacturers have been giving preference for these materials for achieving higher fuel efficiency. 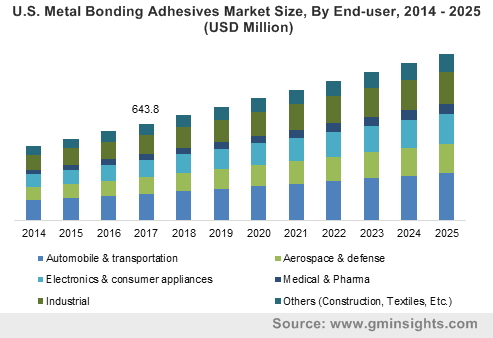 Taking into account the demand for advanced polymer composites, key industry players have been looking forward to extending their product portfolio and regional reach. Tried-and-tested as well as out0of-the-box tactics adopted by companies to consolidate their position in the market is slated to expedite the advanced polymer composites industry size. Recently in May 2018, the well-known aeronautical company, Airbus offered a long-term contract to Teledyne CML Composites to supply composite wings components and assemblies to its commercial airliner. In this contract, the UK based composite manufacturer will provide long range of composite parts for Airbus’ A350-900 and A350-1000 aircraft wings. In order to manufacture both – the wings structure and fuselage of the A350 series aircraft, it has used a carbon-fiber reinforced polymer that will reduce the maintenance cost and improves components’ resistance to corrosion. After receiving the long-term contract from Airbus, Teledyne CML Composites has considerably improved the quality of its composite parts that will help it to gain access to new business opportunities from several other end-users. As of now, numerous companies have been replacing metals with polymer composites for reducing the overall weight of the product assembly. In line with the increasing demand for polymer composites, polymer manufacturers have been focusing on new product developments, capacity expansions, and mergers & acquisitions. Validating the aforementioned fact, in the middle of 2018, Mitsui Chemicals Inc. decided to establish its long glass fiber reinforced polypropylene (LGFPP) production facility in the U.S. pertaining to the growing demand for fiber-reinforced resins across North America. This would considerably augment the commercialization potential of North America advanced polymer composites industry, which as per estimates, held 35% of the overall market share in 2017. Speaking along the same line, Mitsui Chemicals will start its commercial operation by October 2019 with the production capacity of 3500 tons per year that will turn out to be rather beneficial for leading automakers. Owing to the excellent impact resistance, lightweight, better appearance, and hardness, LGFPP is preferred for automotive applications. In the last few years, with the increasing popularity of electric vehicles along with the deployment of strict environmental norms, the demand for LGFPP has increased remarkably. 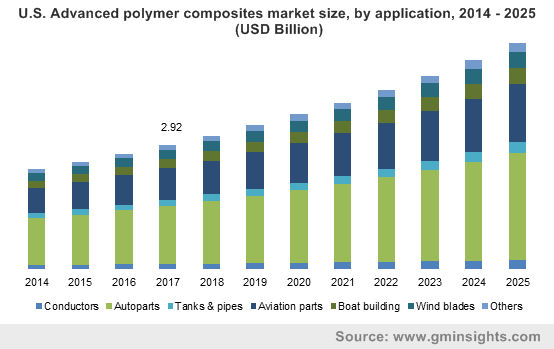 Reportedly, in line with the surging demand for automobiles across India and China, APAC advanced polymer composites market will register a CAGR of more than 8% over 2018-2025. In addition to capacity expansions, several other contributors in the advanced polymer composites industry have been looking forward to enhancing their product portfolio with the strategic mergers and acquisitions. For instance, in June 2018, global provider of specialized polymer material, PolyOne has acquired leading manufacturer of high-performance and advanced composites, PlastiComp. This deal will become fruitful for PolyOne to improve its existing portfolio, aided by PlastiComp’s expertise in the long fiber technology. In the future, PolyOne is planning to launch unique and long fiber technology composite formulations to expand its customer base. The strategies adopted by the players in the advanced polymer composites market to focus on the diverse application scope is poised to boost the industry growth over the years ahead. The collaborative approach undertaken between the OEMs and product suppliers in line with the on-going product innovation and design changes is likely to impel advanced polymer composites industry trends. The shifting trends toward the development of lightweight components for improving the fuel efficiency and curbing emission also will have a positive impact on the product demand. Reportedly, advanced polymer composites market will surpass a revenue collection of USD 17 billion by the end of 2025. This entry was posted in Polymers and Advanced Materials and tagged Advanced Polymer Composites Industry, Advanced Polymer Composites Industry Analysis, Advanced Polymer Composites Market, Advanced Polymer Composites Market 2018, Advanced Polymer Composites Market 2025, Advanced Polymer Composites Market Analysis, Advanced Polymer Composites Market forecast, Advanced Polymer Composites Market growth, Advanced Polymer Composites Market Report, Advanced Polymer Composites Market shatre, Advanced Polymer Composites Market Size, Advanced Polymer Composites Market Trends, APAC Advanced Polymer Composites Market, Aramid, Canada Advanced Polymer Composites Market, Carbon, Epoxy, Europe Advanced Polymer Composites Market, Fiber, Germany Advanced Polymer Composites Market, Glass, Phenolic, Polyester, Resin, U.S. Advanced Polymer Composites Market.